Church & Dwight Co., Inc. ARRID™ Sampling - Welcome to the ARRID™ Sampling Program! Due to inactivity, your online session with Church & Dwight Co., Inc. will expire in 60 seconds. Welcome to the ARRID™ Sampling Program! 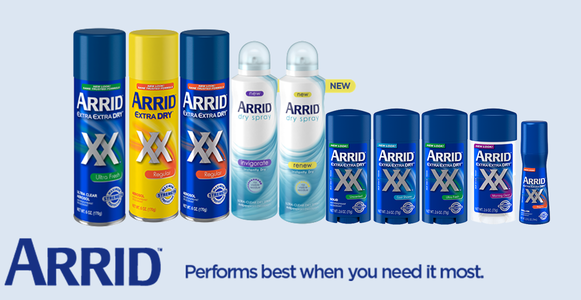 The ARRID™ Sampling Program is a program recently launched by the makers of ARRID™ to get some of our products in your hands in exchange for your honest reviews. As an ARRID™ Sampling Program Respondent, you will be periodically invited to choose products to receive, completely at no cost to you. We value customer feedback about our products, and so do other customers. Authentic reviews are very important in helping shoppers make a buying decision. Through this program we seek to generate more reviews on ARRID.com and other 3rd party websites. The ARRID™ Sampling Program also provides customers the opportunity to get free samples in exchange for their honest and unbiased feedback on new or existing products. As a member, do I have to write reviews to stay in the ARRID™ Sampling Program? If and when you are invited to participate in a specific sampling campaign, we ask that you write a review for the product(s) you receive as a free sample. You may be invitied to participate in multiple sampling campaigns throughout the year, based on your member profile and expressed areas of interest. To maintain your status as a ARRID™ Sampling Program Respondent, you should review at least 75% (3 out of 4) of the products you receive as free samples throughout the year. No. We expect our members to write unbiased, honest and authentic reviews based on their first hand experience with the products. All ARRID reviews will be posted on the product's arrid.com detail page unedited, regardless of whether it is a favorable review or not, provided they follow The ARRID™ Sampling Program General Review Writing Guidelines. Do ARRID™ Sampling Program members get paid for writing reviews? Are reviews collected through the ARRID™ Sampling Program labeled differently?